Irving, who hasn't played since injuring his knee on December 31, is averaging 22.2 points and 6.1 assists this season. 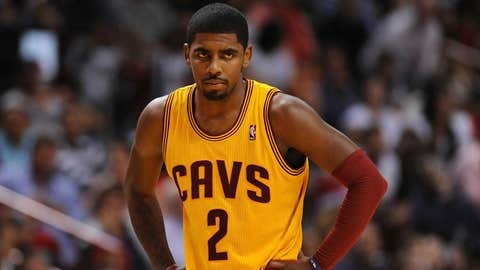 CLEVELAND (AP) — Cavaliers star point guard Kyrie Irving is missing his third straight game because of a bruised knee. He is sitting out Sunday’s game against the Indiana Pacers, and coach Mike Brown says he doesn’t know when he’ll have his leading scorer back. Irving was hurt Dec. 31 when he fell awkwardly while attempting a layup against the Pacers. Irving said he felt "a pop" in his knee and had to be helped off the floor before returning in the fourth quarter. An MRI showed no structural damage. Irving is averaging 22.2 points and 6.1 assists. He played in 31 straight games before missing Thursday’s game against Orlando.